Moving out, moving in. Since interior design has caught my attention quite a bit recently I've been looking around for new dining room furniture. I've been a fan of Scandinavian design and my Interior Pinterest board has expanded during the hours I've been in school. The place we've moved into has an open kitchen area which is connected to the dining room and the living room. It's basically one big open space so it has no boundaries. Having an all white space is definitely one of many positive aspects of our new place and the wall where the windows are is a white painted brick wall. In this post I share some interior/deco inspiration pictures which gave me the idea of the furniture we are going to buy. 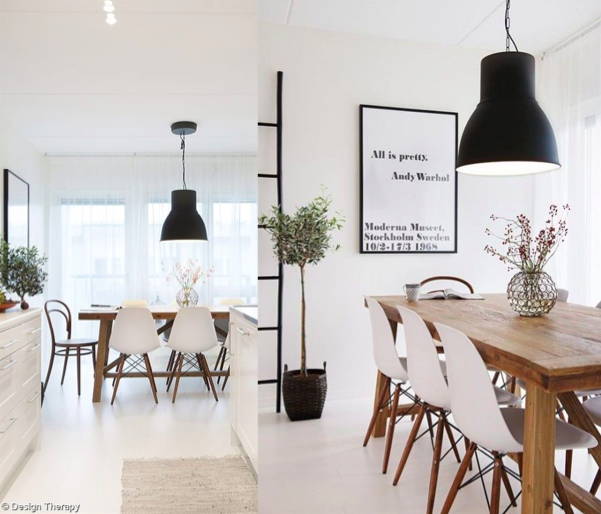 In the search field on Pinterest I typed in Scandinavian dining room and stumbled upon these pictures. 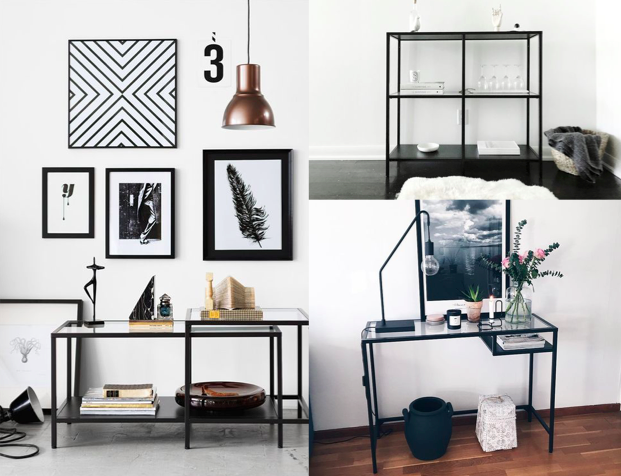 I love the combination of an all white space, wood and black colored details (lamps, frames). We already have the Ikea VITTSJÖ coffee table set in white so we were kind of in doubt whether to pick the VITTSJÖ shelving unit in white or black. I found some pictures of the furniture series in black. But I still think we would probably pick white since we already have the coffee tables in white! 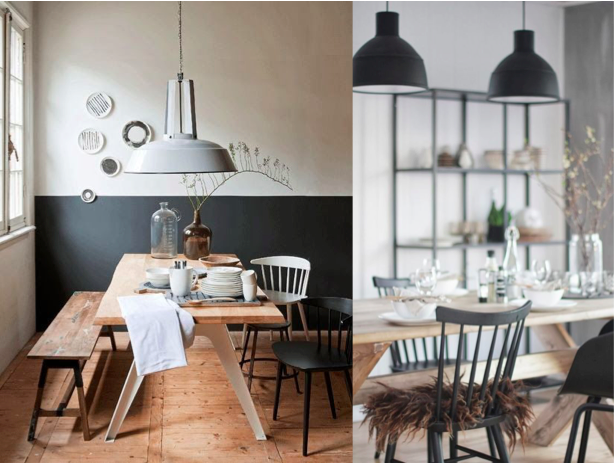 Another aspect I'd like to incorporate in our new dining room area is the mix and match of different styles. As I mentioned before I love the combination of wood and black/grey furniture when your walls are white. Also combining chairs with a bench gives a cosy feel and works very inviting. Add a sheepskin to the wooden bench = picture perfect! Since we have this big open space, the room just needs a big table. A table of 170cm would look a little bit lost so we decided to buy one of 240cm, and we still got enough room to walk around it and place the chairs and benches. Next: the rug. Either it's the eye-catcher of the room or it is just part of a whole that makes the setting complete. 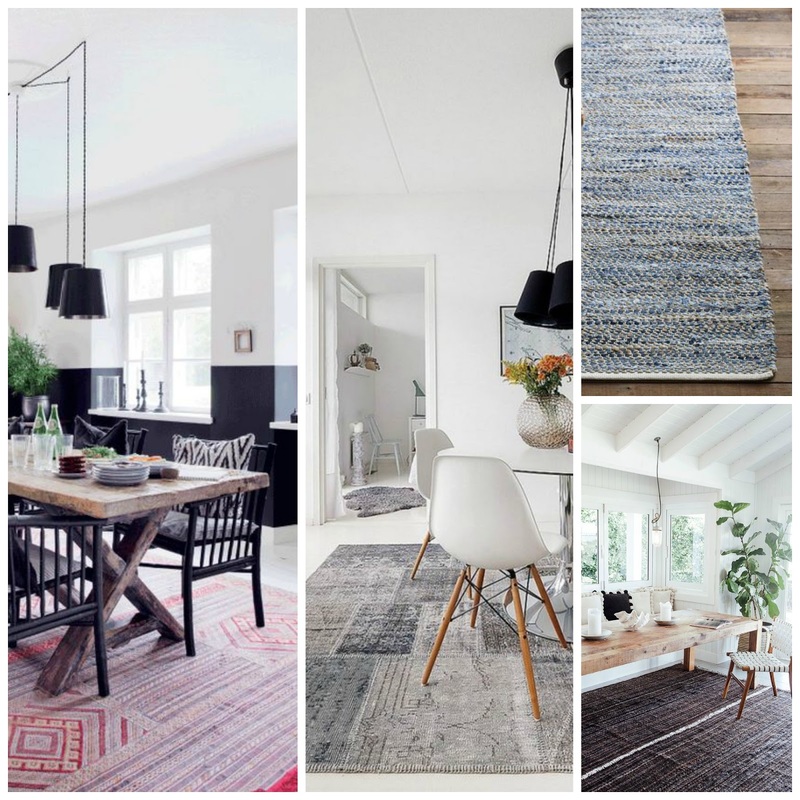 I found some really nice ones on Pinterest, and I think we would rather go for a subtle rug. I would rather have a piece of furniture being the eye-catcher of the room, maybe a desk or some shelves in a bold color (but that's something for the future). Stay tuned for the next interior posts, which will include our new dining room!